When 4449 took an 11-car passenger train in vintage Daylight garb to San Jose and back in 1992 for the NRHS convention, few realized this would be the final appearance of 4449 with a full Daylight train. Passengers and fans delighted in a vintage Daylight performance under clear blue skies. Soon afterwards, however, the passenger cars were dispersed and Union Pacific’s acquisition of Southern Pacific closed the route to any steam locomotives except Union Pacific’s own. Thankfully for 4449 and steam enthusiasts, Burlington Northern Santa Fe stepped forward to operate the locomotive. Dramatic evidence of 4449’s new excursion career occurred in June 1998 as 4449 took a streamlined passenger consist, including short-dome cars, on a scenic two-day adventure on the BNSF along the Columbia River and through the canyons and over the bridges of the Deschutes River to Bend, Oregon. Multiple camera crews capture many locations along this scenic line. We have cameo appearances of 4449 doubleheaded with SP 4-6-2 #2472 at the NRHS convention. 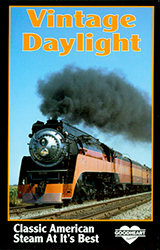 Witness classic 4449 operations across two states, along with a cab ride, as we close the 20th century in VINTAGE DAYLIGHT.